Most of Boston’s wood or metal doors recede visually rather than standing out. 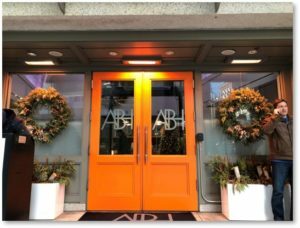 The Ames Boston Hotel aims to be noticed with bright orange doors. They put a 21st century entrance on an historical building that was once Boston’s tallest structure. Before it became the Ames Boston Hotel, the structure housed a bank and offices. It also demonstrated an architectural style that was developed in Boston. Originally designed to house the Old Colony Bank, the headquarters of the Ames Agriculture Equipment Company, and architectural offices, is now a boutique hotel only steps from Boston’s famous Freedom Trail and the Old State House. The wealthy businessman who commissioned the Ames Building was Frederick Lothrop Ames, son of Massachusetts state senator Oliver Ames Jr. and grandson of family patriarch Oliver Ames. Known at the time as the wealthiest man in Massachusetts, Frederick Ames added to the family fortune by perfecting the design of the military shovel that became standard equipment for the United States Army. The Army used Ames shovels in every conflict from the Civil War to the Korean Conflict. 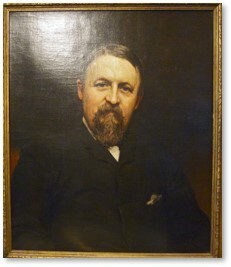 Frederick Ames would likely have given the commission for a building with his name over the door to Henry Hobson Richardson. Mr. Richardson had already completed 12 buildings for the Ames family starting in 1877. The architect’s untimely death in 1886 at the age of 48 put an end to their relationship. Shepley, Rutan and Coolidge the firm that inherited H.H. Richardson’s architectural business, took over the Ames Building as its first commission and later moved their offices there. That began a tradition of the firm working out of buildings it had designed. Note 1: If you would like to see and learn about the Ames family’s spectacular mansion on Dartmouth Street, take Boston By Foot’s Back Bay walking tour. The Ames Building went up from 1889 to 1893 at the intersection of State Street, Court Street, and Washington Street between the northern edge of the downtown financial district and southern edge of Government Center. 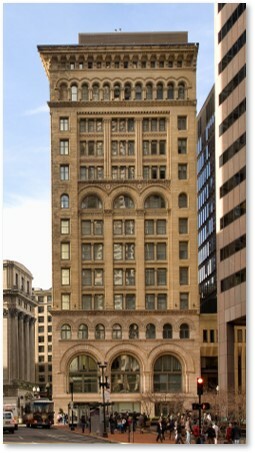 Once interior work was completed in 1893 and the building could be occupied, it quickly rose to become a prominent office location in Boston’s growing financial district. Its 14-story height also offered Bostonians a previously unheard-of vantage point from which to look down on the city. The office building’s roof became a popular tourist attraction. The Ames Building was listed as the city’s tallest building for 22 years until the Custom House Tower was built in 1915. Actually, the Church of the Covenant’s steeple rose higher but one couldn’t stand on top of the steeple to gaze at Boston. The Ames Building certainly holds the record as Boston’s first skyscraper, however. At 196 feet it is still the second tallest building in America with structural masonry walls. Chicago’s Monadnock Building occupies first place.The Ames Building was quite probably the first commercial edifice in Boston designed to use an elevator — a good thing for tenants above the third floor. Creating a building style unique to its time, Shelpley, Rutan and Coolidge blended the Richardsonian Romanesque, Classical, and Byzantine architectural styles. 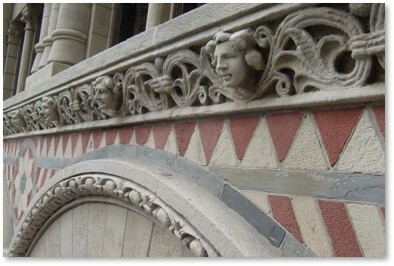 They also incorporated a polychromatic stone mosaic and intricate decorative carvings around the arches. Structurally, the Ames Building relies on load-bearing, exterior masonry walls with interior steel supports. Over three feet thick, these walls widen to nearly five feet at the base. They flare as they meet the sidewalk to support their own weight. If we could use X-Ray vision to see below the street’s surface, we would find granite footings nine feet thick. It took a lot of stone to support the city’s first skyscraper. The architects massed the classical elements visually into three distinct sections that represent the base, shaft and capital portions of a column. Monumental Romanesque arches mark the distinct four-story base of battered Milford granite. Three large openings pierce the massive load-bearing blocks on the Court Street and Washington Place sides. The middle opening of the Court Street facade now does duty as the Ames Boston Hotel’s main entrance with its orange doors. The remaining openings served as windows for the bank and stores that occupied the street level during the Ames Building’s early years. 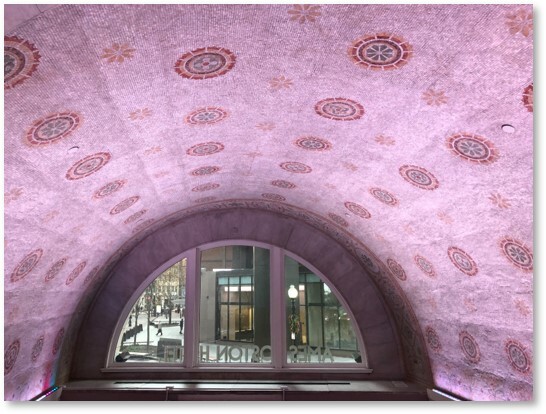 On the second and third floors, monumental Romanesque arches provided light for the main banking floor. An eight-story superstructure clad in Ohio sandstone rises from the base as the “column’s” shaft. The ninth floor divides this section horizontally, breaking the pattern of rectangular windows with its round arches supported by grouped columns. A mosaic of red Longmeadow sandstone and North River blue slate inspired by the Byzantine style decorates the window spandrels. Carved granite figureheads delineate a narrow string course. I wish these decorative elements weren’t so high up and difficult to see from street level without binoculars. The building’s capital segment, 28-feet tall, comprises two floors. A single band of arcaded windows pierces the 13th floor. Small attic windows line up beneath a dramatic projecting cornice of ornate corbels that caps the building. 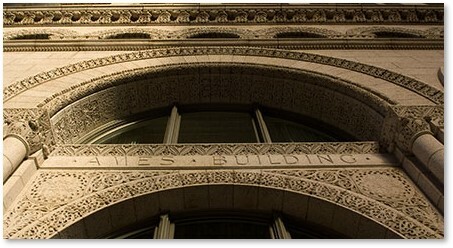 The Ames Building was added to the National Register of Historic Places in 1974 and designated as a Boston Landmark by the Boston Landmarks Commission in 1993. Note 2: Read the Boston Landmarks Commission Study Report on the Ames Building. The Ames Hotel Partners, LLC) and Normandy Real Estate Partners purchased the Ames Building for $17.7 million in 2007 after it had been unoccupied for eight years. Cambridge Seven Associates designed the renovations, which were carried out by Tishman Construction Corporation of New York. Note 3: Learn more about the masonry restoration in “Masonry Restoration: The Ames Building” on the Traditional Building web site. 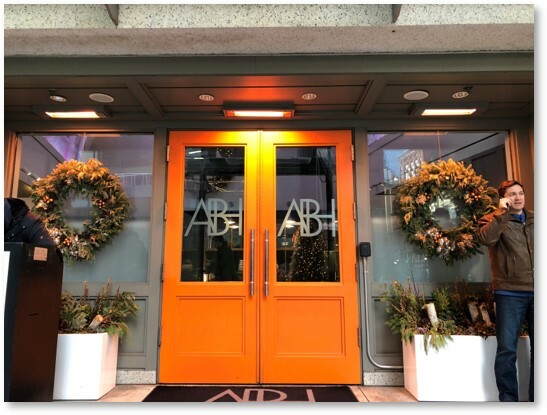 The Ames Boston Hotel gives you the opportunity to walk through those bright orange doors and look around. Check out the carefully restored mosaic tiles on the lobby’s vaulted ceiling. Have a drink in the bar and soak up the historic ambiance. Note 4: If you need a place to go in Boston, walk through the lobby to the elevators. Go up to the mezzanine and turn right. The mezzanine also gives you a great close-up view of the mosaic-tiled ceiling. This entry was posted in Boston, History and tagged Ames Boston Hotel, Ames Building, Boston by Foot, Boston Landmarks Commission, Byzantine style, Classical Style, Frederick Lothrop Ames, H.H. Richardson, Old Colony Bank, Richardsonian Romanesque, Shepley Rutan and Coolidge, Traditional Building by Aline Kaplan. Bookmark the permalink.